Radishes are in season during the cool weather of spring and fall. Once exposed to long periods of warm weather, the spicy heat of the radish intensifies, sometimes to the point of becoming inedible. Radishes are easy to grow, but once they’re ready to pick, you could end up with more than you know what to do with. Here’s one clever way a friend of mine enjoys them, and I would never have thought of this myself! Use regular cream cheese or Neufchâtel, which is a lower-fat cream cheese. Lactose intolerant? No problem! There are some decent non-dairy versions as well. Give these a try and see what you think! You will not be disappointed by this simple, yet unusual combination. The crisp texture and spicy flavor contrast beautifully with cream cheese. We serve this as an open face sandwich, or cut into smaller pieces for a nice spring or fall appetizer. Leave cream cheese and butter out about 15 minutes to soften. Lay 2 thin slices of bread on a flat surface. Spread about 1/2 teaspoon softened butter evenly on each slice, then spread 1 tablespoon cream cheese over each piece. 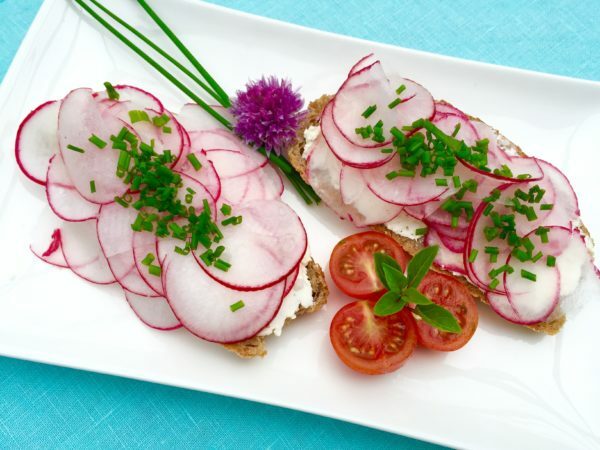 Thinly slice radishes and scatter over the cream cheese. Sprinkle a pinch salt (regular, coarse, or Himalayan pink) on top. Slice fresh chives to add on top. Garnish plate with longer pieces of chives and a chive blossom if desired. Serve this open face with spread on each piece of bread, or make 2 sandwiches by topping each one with another slice of bread. You can cut off the crust if you want, for a fancy tea party, then cut into smaller finger sandwiches. Cut the open faced slices into smaller pieces for appetizers. ← What’s the FODMAP-free diet?